Hard day in the garden, prepping for fall planting, saving the last of the “free range” strawberries, and beating back the weeds blocking access to the blackberries. 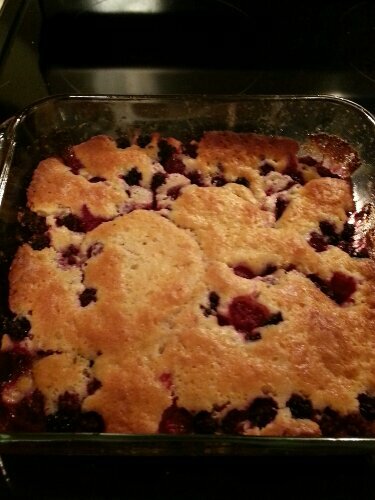 My reward: blackberry cobbler! Also a great use for not-pretty-produce…who cares what they look like when baked in a cobbler? Especially with vanilla ice cream! Preheat oven to 375. Melt 4 Tbs butter in a 9 x 9 pan in the oven. While butter is melting, mix 1/3 c sugar, 1/2 c milk, and 1 c Bisquick (or similar baking mix) in one bowl to make the batter. 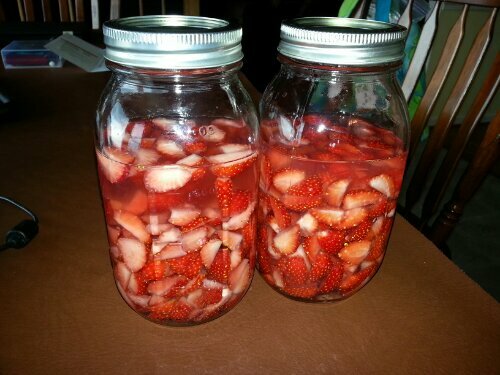 Mix 2 c berries 2 Tbs sugar in another bowl. When the butter is melted, pour the batter into the bottom of the pan. Drizzle the berry/sugar mixture evenly over the batter. Bake for 45 minutes. Top with ice cream or anything suitably delicious and enjoy! Categories: Cooking, Gardening | Tags: dessert, not-pretty-produce, Recipes | Permalink. 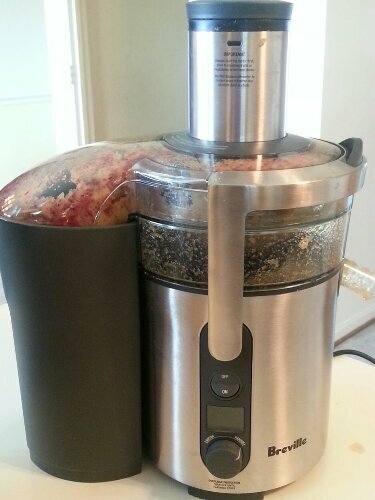 Our new juicer! Well, technically my husband’s, but I get the benefit of it too! One of my hardest adjustments to gardening was realizing that produce is never as pretty as it was in the super market. Tastier, fresher, healthier – sure. But also sunburned and bug nibbled and misshapen. I think commercial produce growers deal with this by selling the prettiest fruits and vegetables for the produce department, and reinvent the not-pretty-produce into other revenue streams. Juice, jellies, prepared & packaged items (bagged lettuce anyone? )…the possibilities are endless. So I’ve created a new tag for my own personal solutions for the not-pretty-produce we produce….except from now on, we’ll probably just throw everything in the Breville! Categories: Gardening, Health | Tags: not-pretty-produce | Permalink. Categories: Cooking, Gardening | Tags: not-pretty-produce, Recipes | Permalink.